Hello my friends! Happy Hump Day! It’s been a while since I haven’t written a personal style post but as you’ve seen I’ve been very busy with Coachella, His and Hers series, collaborations, and most recently the Metropolitan Fashion Week post. This latter one was very well received by you and I must say that I’m infinitely grateful. Hopefully that will open many more doors for future fashion events and for me to continue writing for the fashion world; requests and comments and emails are coming from everywhere. 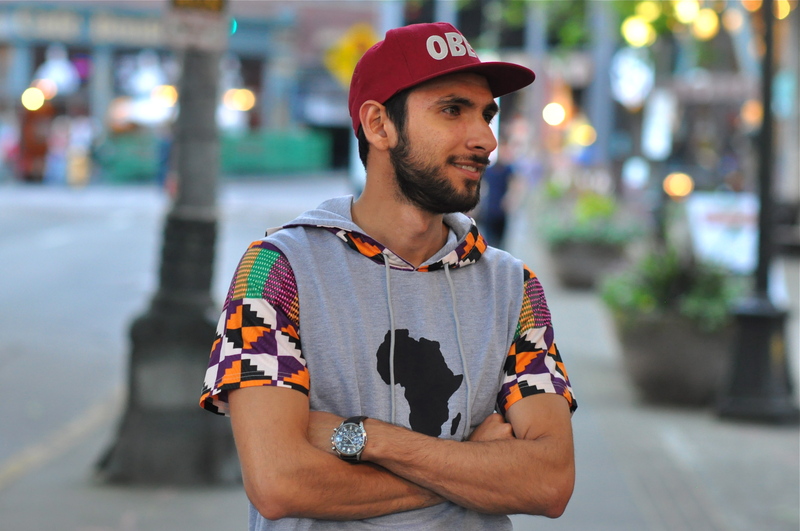 It also takes me a bit closer to my goal of becoming a larger fashion influencer in the city of Seattle and that is ultimately what I want to do with this blog and this project in general. 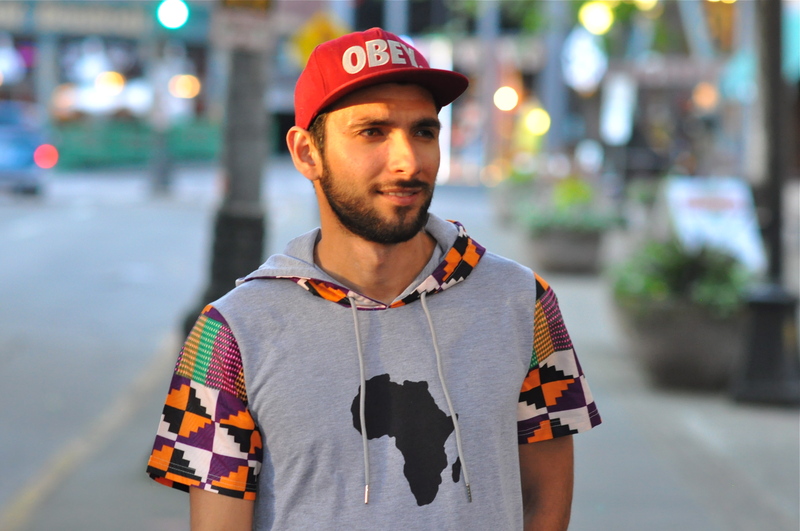 Speaking of Seattle fashion, today I bring you a collaboration with a local Seattle brand called MEMEH. 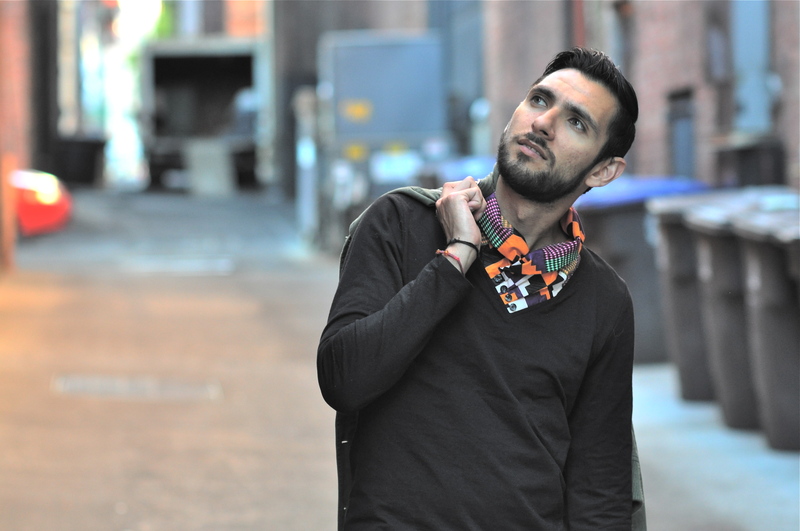 This brand is owned by local Seattle fashion designer Nanie Memeh, which is not only an amazing creative but also a really good friend of mine. Nanie is from African descent, and she has been doing clothing for a while already; this is her second collection actually. What made Nanie’s first collection super special was that she incorporated fabrics that come straight from Africa to her designs, and I must say, I automatically fell in love with these garments when I saw the beautiful bright colors and extraordinary patterns these designs have. Initially Nanie was doing complete gowns and dresses out of these fabrics, and after noticing that it was expensive to use these fabrics for her whole designs, she decided to start a second line. This time she did menswear instead, and she mixed both American street style with the traditional African fabrics, and my friends, she hit the jackpot with these. The new collection is incredible! Here you can see me wearing two of her signature pieces. 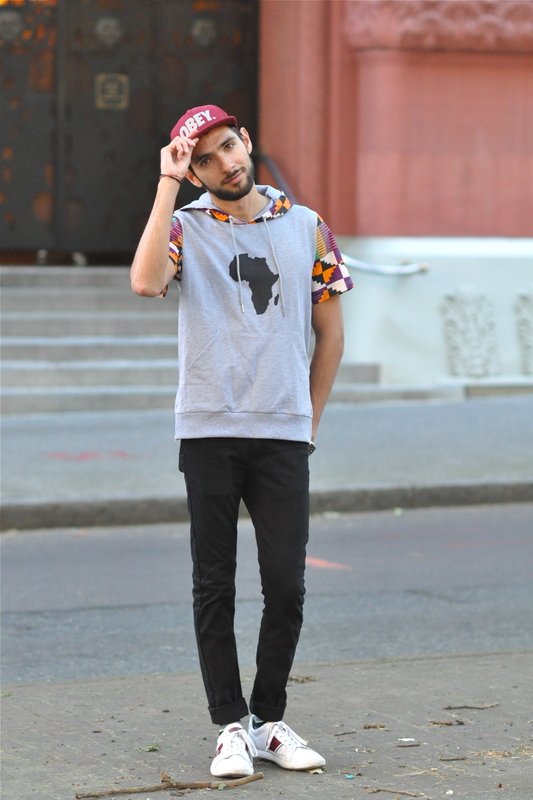 The first piece is a black long-sleeve t-shirt with a beautiful collar made out of one of the African fabrics. First of all, I must say that the fit was perfect, these garments fit like a glove and feel very light and wearable. The other really cool thing I noticed is how easy it is to combine them with everyday clothes and make a killer look out of it. 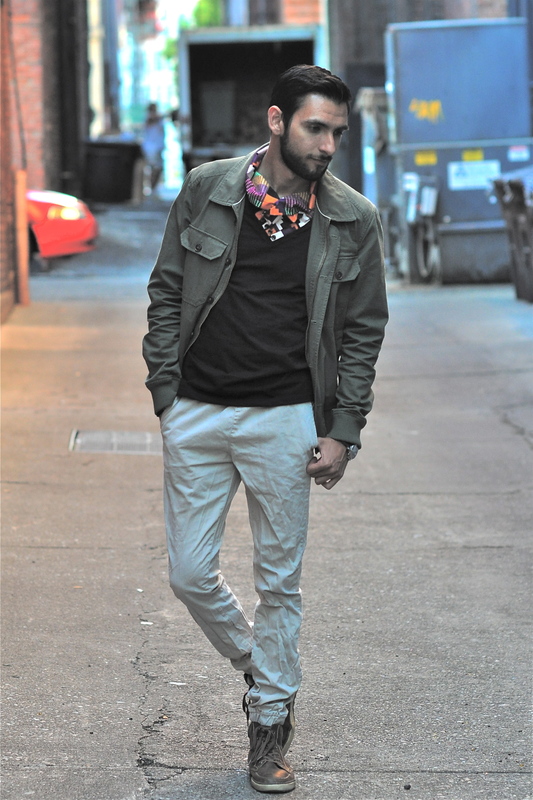 Take for instance this look of military green jacket with joggers and the black t-shirt. 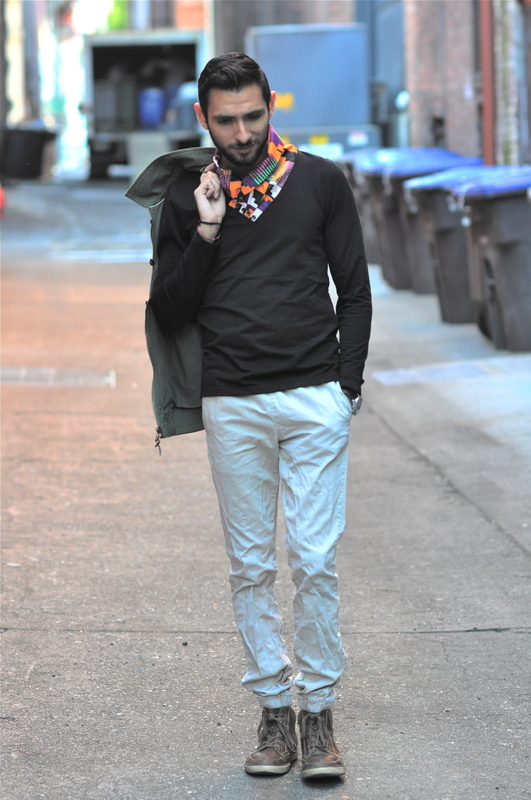 This look would work for any casual situation, and the color from the collar pops up really well. 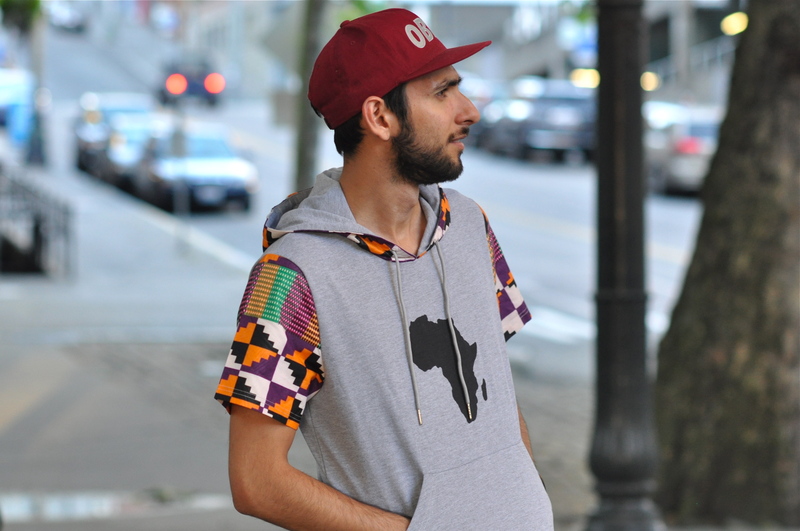 For the second look, we have a short-sleeve, gray sweatshirt with a hoodie, where this time the African fabric was placed on the sleeves and in the hoodie. 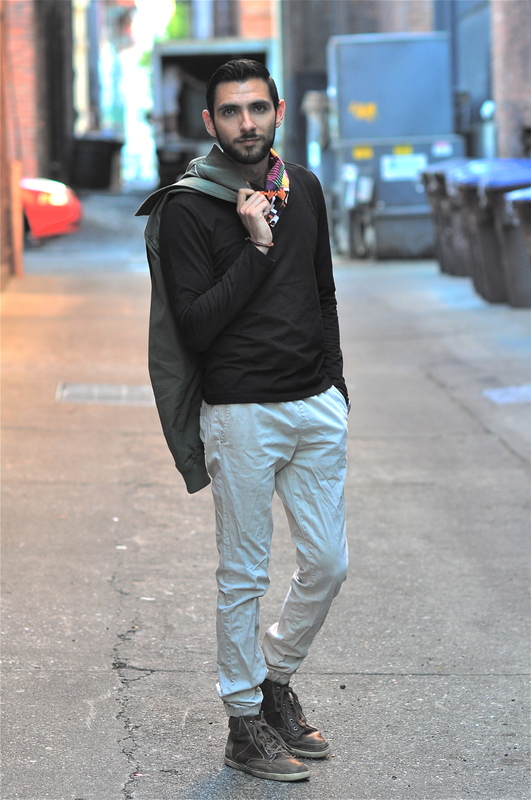 This worked really well with my pair of black denim jeans and Obey hat, giving the whole look a very streetstyle, urban feel. 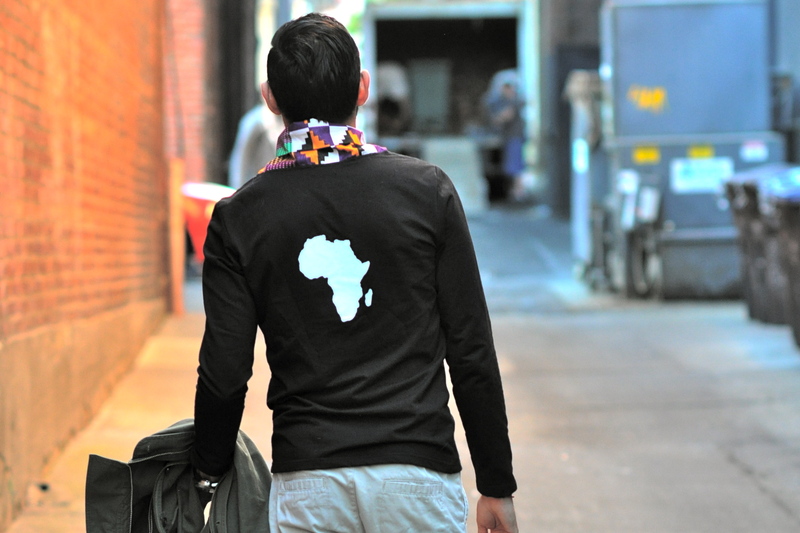 Same as in the first piece, you can see the silhouette of the African continent which represents the heritage of this clothing. What do you guys think? Do you like how I styled these two pieces? 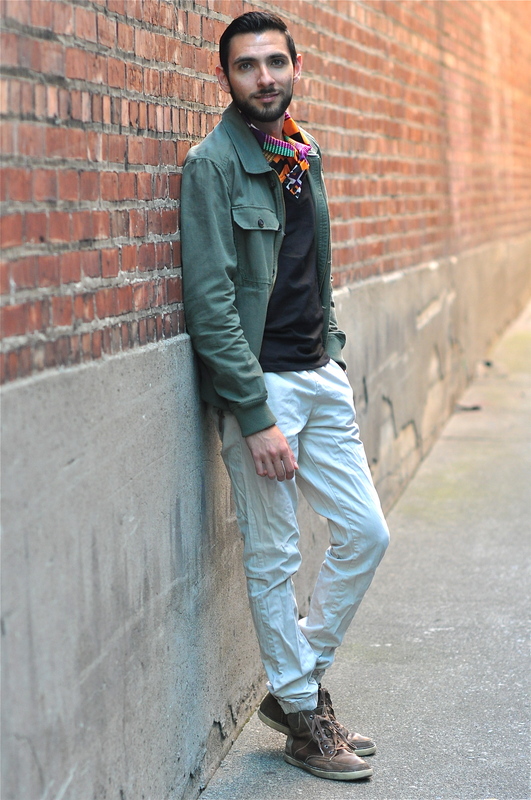 I want to thank my roommate Carlos for taking these photos for me in the alleys and corners of Pioneer Square here in Seattle. 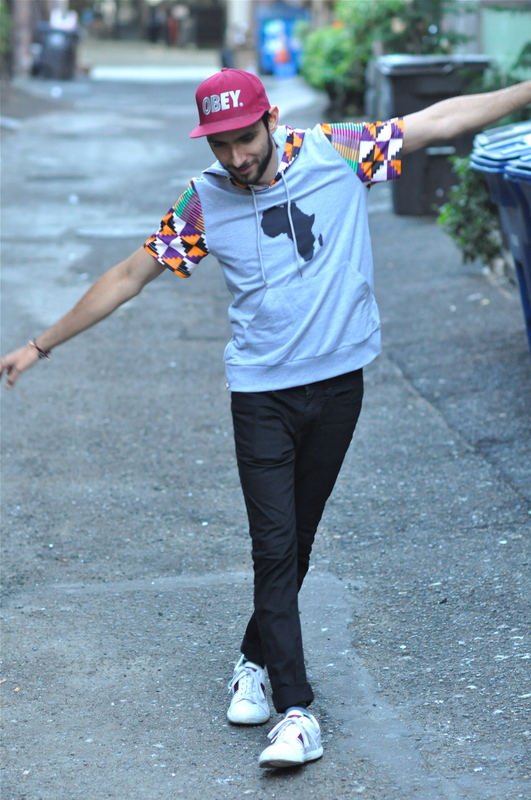 I feel that the mix of urban American culture and the African prints, as well as the references to the African continent really make this collection unique; it’s so thoughtful to bring the two together. Right now we are in a time when movements like Black Lives Matter and most recently Beyoncé’s new album, Lemonade, remind us that being an African American living in the US is hard, but that we are all equal and we all must enjoy the same rights as others. Being myself someone who is a Mexican trying to make his dream come true in America, I can relate to the struggle these people go through everyday and I feel that telling this story through clothing and fashion is a great way of conveying the message and getting everyone onboard of the equal rights movement. In the end we are all just people, sharing a space on this Earth and trying to accomplish our own goals, and there shouldn’t be a reason why any prejudice, ideology, or preconception gets in the way of others fulfilling their own goals and realizing their own lives. I don’t want to get too political on this and I do believe we’re on the right track but we need to raise our voices a little higher and specially lead with example by treating others how we want to be treated. That’s it for today my friends. Again I want to thank Nanie for sharing with us her view in this amazing collection. As you can see, there’s a lot of potential here for someone becoming the next great star in fashion, so please give her a hand by following her on social media and by supporting her dream. As of me, next week I’ll be traveling to Chicago for the first time for attending some really good friends’ wedding and I can’t wait to meet the Windy City. I’ll try to take as many pictures as possible to share with you guys, I’m really excited about this trip. There’s also one more collaboration in the making coming to the blog, so as always, keep posted and keep sharing your thoughts and comments with me. I’ll leave you for now, not without first reminding all of you to be stylish and to let your voice be heard. See you next week with more fashion and more style. Till next Wednesday! ¡Hola amigos míos! ¡Feliz miércoles! Ha pasado un tiempo ya desde la última vez que escribí un post de estilo personal, pero como se habrán dado cuenta, he estado muy ocupado últimamente con Coachella, la serie Él y Ella, colaboraciones y más recientemente el artículo sobre Metropolitan Fashion Week. Este último fue muy bien recibido por todos ustedes y debo decirles que les estoy infinitamente agradecido. Espero que eso me abra muchas puertas para eventos de moda en un futuro y me dé la oportunidad de seguir escribiendo para el mundo de la moda; propuestas y comentarios e emails me están lloviendo por todos lados. También me acerca un poco más a la meta de convertirme en una mayor influencia para la industria de la moda en la ciudad de Seattle que es a final de cuentas lo que quiero lograr con este blog y este proyecto en general. 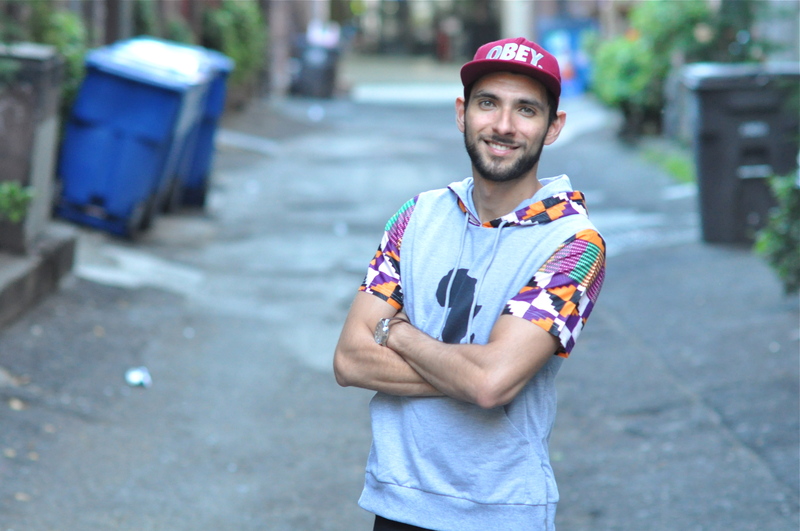 Precisamente hablando sobre moda de Seattle, el día de hoy les traigo una colaboración con una marca de ropa local de Seattle llamada MEMEH. Esta marca le pertenece a la diseñadora de modas local Nanie Memeh, quien además de poseer una excelente mente creativa es también una gran amiga mía. Nanie es de ascendencia africana, y ella lleva ya un tiempo haciendo ropa; de hecho esta es su segunda colección. Lo que hizo de la primera colección de Nanie una muy especial fue que incorporó telas provenientes directamente desde África en sus diseños, y debo admitir que automáticamente me enamoré de estas piezas en el momento en que vi los colores tan brillantes y los patrones extraordinarios de estos diseños. Inicialmente Nanie estaba haciendo vestidos y ropa puramente en estas telas pero, tras notar que usarlas puramente en sus diseños era algo caro, decidió empezar una segunda línea de ropa. 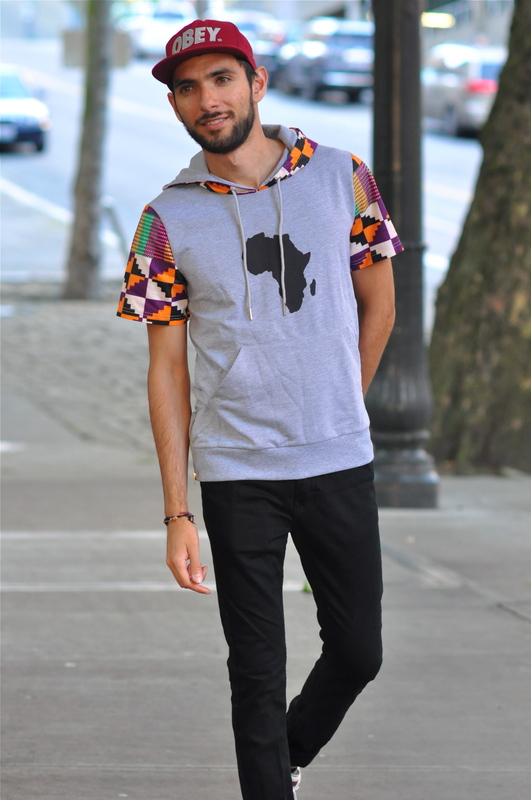 Sin embargo, esta vez sería ropa para hombre, y al mezclar el estilo de las calles de Estados Unidos con las telas más tradicionales africanas, amigos míos, Nanie dio en el clavo. ¡La nueva colección está increíble! Aquí me pueden ver vistiendo dos de sus piezas más representativas. 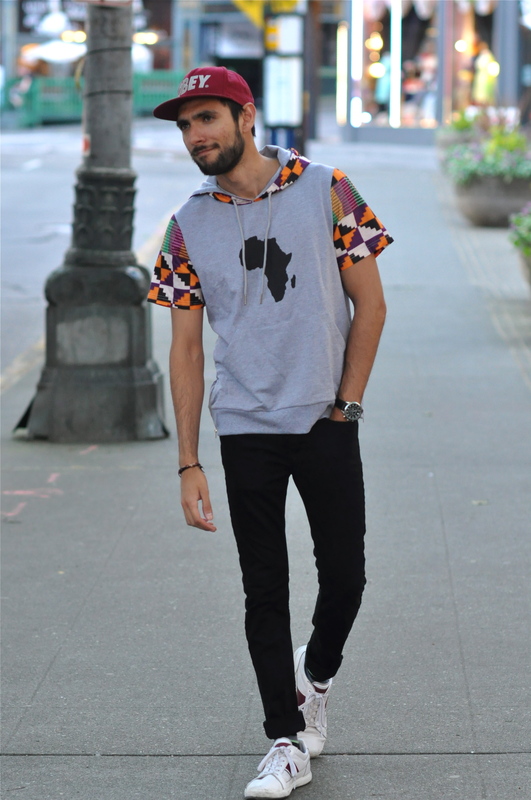 La primera es una camiseta de manga larga negra con un adorno en el cuello muy bonito hecho con una de las telas africanas. Primero que nada debo decirles que la camiseta me quedó de maravilla, esta ropa se ajusta a tu cuerpo como un guante y se siente muy ligera y fácil de vestir. La otra cosa muy buena que noté es lo fácil que es combinarlas con la ropa del día a día para crear looks increíbles. 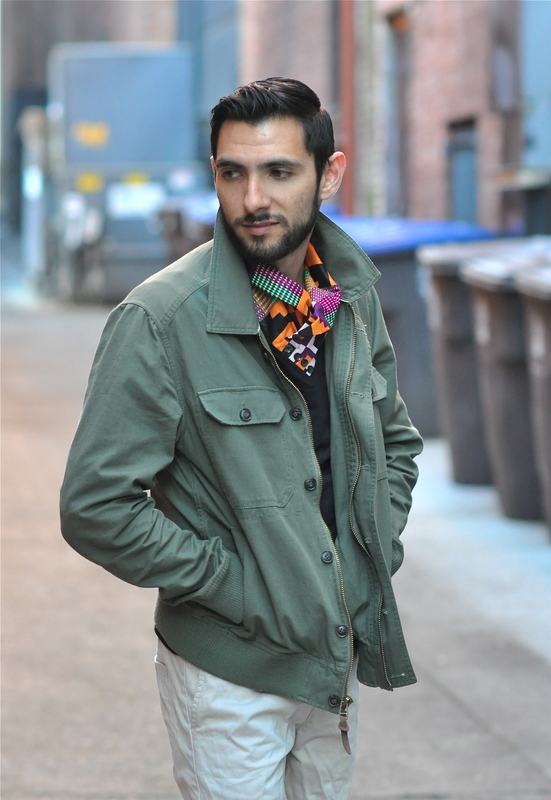 Tomemos, por ejemplo, esta camisa con la chamarra color verde militar y mis joggers como en estas fotografías. 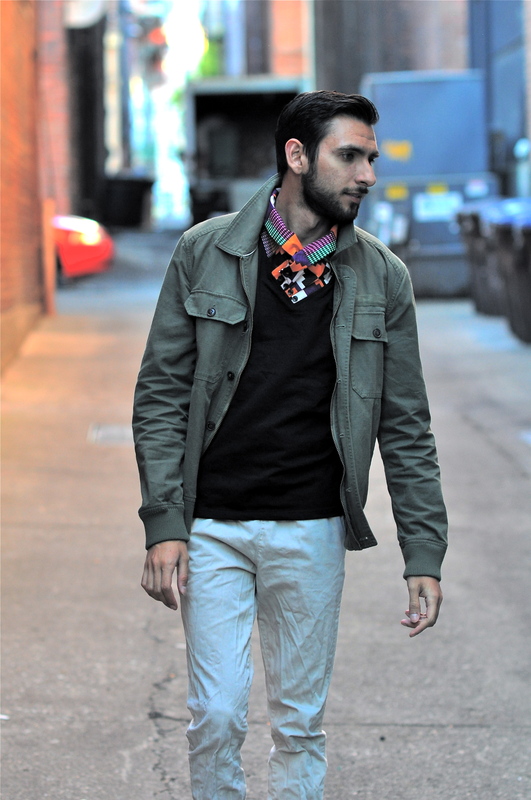 Este look funcionaría en cualquier situación casual y el color del cuello levanta muy bien y se hace notar. 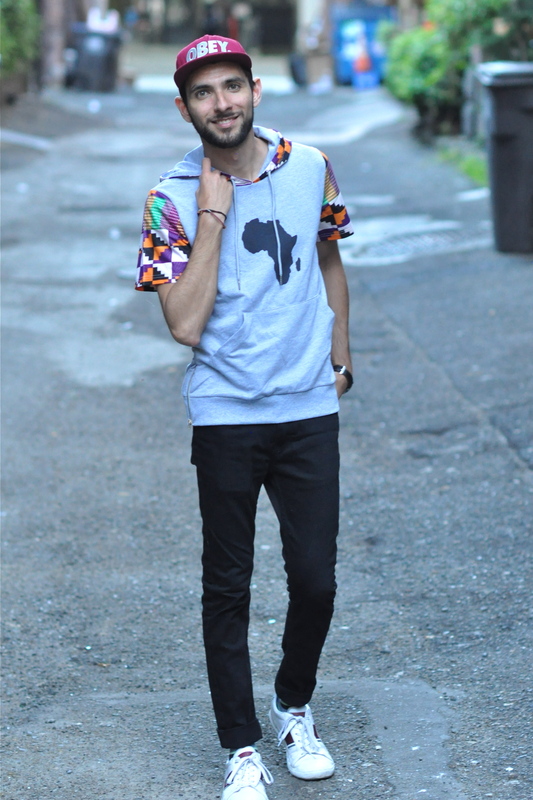 Para el segundo look, tenemos una sudadera de manga corta con gorra, donde esta vez, la tela africana fue colocada en las mangas y en la gorra. Esto emparejó muy bien con mi par de pantalones de mezclilla negros y una gorra de Obey, dándole a todo el look un sentimiento callejero y urbano y, como en la primera pieza, podemos ver la silueta del continente africano, recordándonos de donde viene esta ropa. ¿Qué les parece? ¿Les gusta como combiné estas piezas con mi propio estilo? 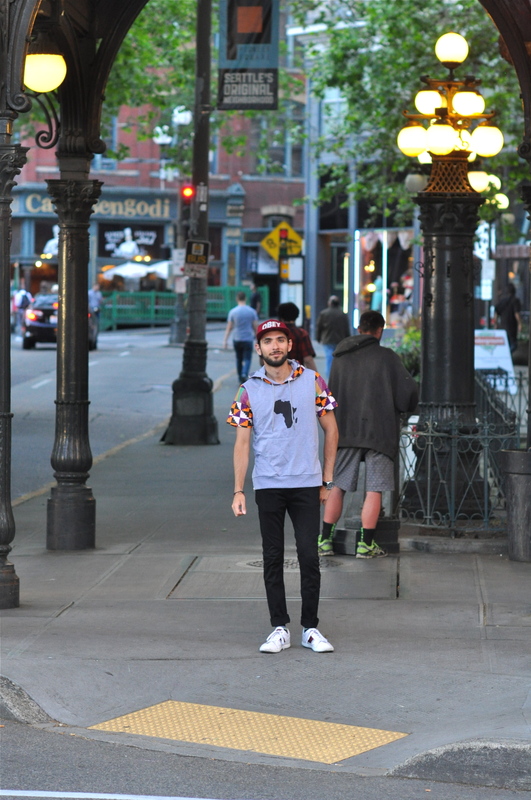 Quisiera agradecer a mi roomie Carlos por tomar estas fotos en los rincones y callejones de Pioneer Square aquí en Seattle. Siento que la mezcla de la cultura estadounidense con los estampados de origen africano y las referencias a África realmente hacen de esta colección una colección única y es brillante el traer a las dos juntas. Especialmente en estos tiempos, donde movimientos como Black Lives Matter y más recientemente el nuevo álbum de Beyoncé, Lemonade, nos recuerdan lo difícil que es ser afroamericano en los Estados Unidos, pero que todos somos iguales y por ende debemos disfrutar los mismos derechos que los demás. 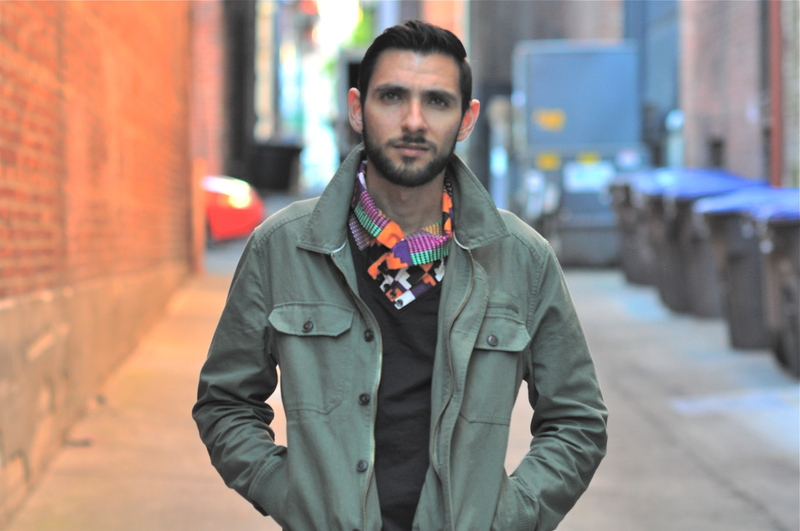 Siendo yo un mexicano viviendo en Estados Unidos y tratando de hacer mi sueño realidad, puedo identificarme con la lucha por la que tienen que pasar estas personas y siento que contar esta historia a través de la ropa y la moda es una gran forma de transmitir el mensaje y convencer a todos del movimiento de derechos igualitarios. Porque al final todos somos sólo personas, compartiendo un espacio en este planeta Tierra y tratando de cumplir nuestras metas, y no debe de haber ninguna razón por la cual un prejuicio, ideología o preconcepto se interponga en que otros cumplan sus propios objetivos y disfruten sus vidas. No quiero ponerme muy político aquí, pero sí quiero decir que creo que vamos por buen camino pero necesitamos alzar la voz todavía más en este tema, y educar con el ejemplo tratando a otros como queremos ser tratados. Eso es todo por hoy mis amigos. Una vez más quiero agradecer a Nanie por compartir con nosotros su visión con esta increíble colección y como pueden ver, hay mucho potencial aquí para que alguien se convierta en la siguiente estrella de la moda, así que denle una mano a ella siguiéndola en redes sociales y apoyando su sueño. En cuanto a mí, la siguiente semana estaré viajando a Chicago por primera vez para la boda de unos muy buenos amigos míos y ya no puedo esperar por conocer a la Ciudad Ventosa. Trataré de tomar la mayor cantidad de fotos posible y de compartirlas aquí con ustedes, estoy muy emocionado por este viaje. También quiero comentarles que hay una colaboración más que estoy preparando y que presentaré muy pronto por aquí, así que manténganse al pendiente y sigan compartiendo conmigo sus pensamientos y comentarios. Los dejo por ahora, no sin antes recordarles que se vistan con su propio estilo y que dejen que los demás escuchen su voz. Nos vemos muy pronto con más moda y más estilo. ¡Hasta el próximo miércoles! Thank you so much Ilya! I’m glad you liked it :D! Thank you so much! I’m glad you liked it :)!